You guys! I have such an exciting recipe for you today! Can you even believe it?? The last time I posted a cocktail recipe was in 2010. EIGHT years ago! Where’s that embarrassed wide-eyed emoji when you need it? They were a delicious combination of champagne, cranberry and lime juices with fresh cranberries floating on top. One of my favorite drinks to this day is a simple vodka-cranberry and those bellinis were pretty similar. Except that instead of the bite of vodka, you get a bubbly mouthful of champagne. Mmmmm! And while we’re on the topic of vodka, let me tell you that I probably will never turn down a drink with vodka in it. I don’t drink vodka often – gin is my actual preference when it comes to spirits – but I love vodka because it’s sort of like the blank palate of the drink world. It goes so well with lots of flavors! Enter The Mistletoe Kiss. And pucker up, friends! Because this drink is a delightful mixture of vodka, club soda, lemon juice, and my new secret weapon: rosemary simple syrup. 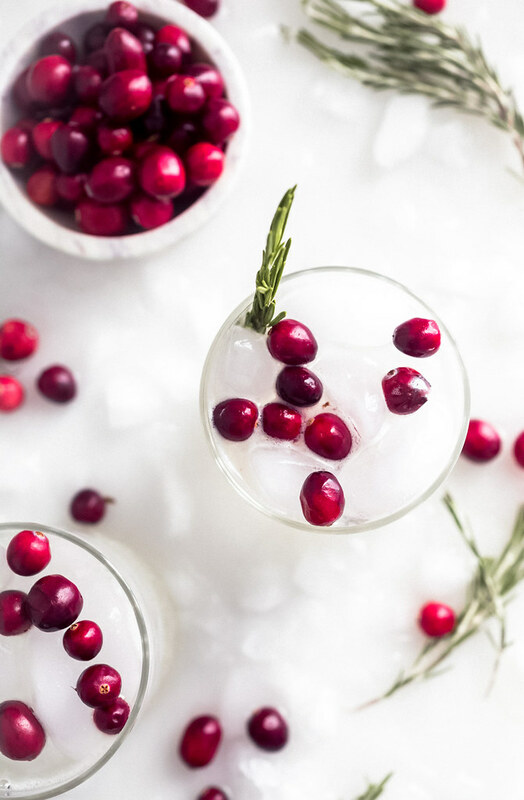 Float some fresh cranberries on top and add a sprig of rosemary to stir it all up, and you’ve got yourself a perfect holiday drink. And the rosemary simple syrup beautifully balances the tart lemon and bite of the vodka. It gives the drink a refreshing sweet and herbal note and really brings it home to remind you that it’s the holidays. Wondering How to Make a Large Batch of Mistletoe Kiss Drinks? 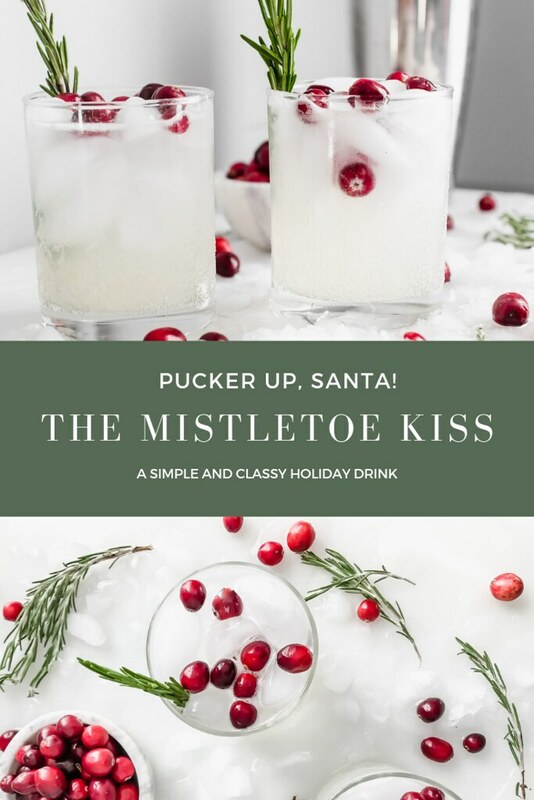 If you’re having a crowd for a tree trimming party or holiday party this season, you’re going to want to make a large batch of these mistletoe kiss drinks. And it’s SO simple to do! First, you’re going to make a batch of the rosemary simple syrup. It’s easy! Boil equal parts of sugar and water for 5 minutes then toss in a sprig of rosemary to steep and release its flavor into the syrup. Cool completely. You can make this up to 2 weeks in advance too! Then, ready a pitcher. Pour in the vodka, lemon juice, rosemary simple syrup and stir well. Pour the drinks into ice-filled rocks glasses – only 3/4 of the way full though. You need room for the club soda. Top the drink off with club soda, a few cranberries, and a sprig of rosemary to use as a stirrer. You can certainly prepare the drink mixture in the pitcher a few hours in advance of your party and keep it in the fridge until your guests arrive. 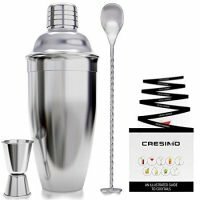 This will ensure the mistletoe kisses are super cold and will majorly simplify your life during the party when you would prefer to be mingling and eating rather than pouring individual drinks. 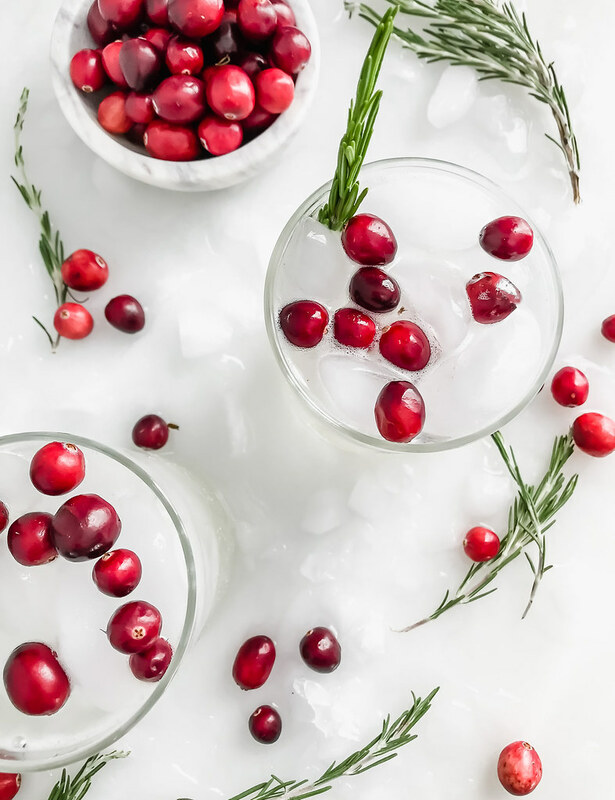 And while we’re on the topic of parties, let’s talk for a quick minute about some excellent appetizers you can serve with these mistletoe kiss holiday drinks at your next party. I adore a really nice plate of cheese and crackers. It doesn’t have to be a big to-do of a cheese platter, though if you want to go in that direction, my girl Annie posted an excellent cheese and charcuterie board 101 a few weeks ago. I really love to make homemade wheat thins and serve them with cranberry Stilton during the holidays. And maybe I’ll throw in a hot crab dip if I have a few extra minutes to prepare one. Easy one-bite appetizers would be these brie and caramelized onion bites or these maple bacon mini quiche. Smoked salmon spread is always an easy appetizer that will instantly fancify your party. And in my opinion, no holiday party would be complete without some sausage stuffed mushrooms and a baked brie with fig jam and honey. Now, what are you waiting for? Go crack open that bottle of vodka, grab the mistletoe, and pucker up, my friends! 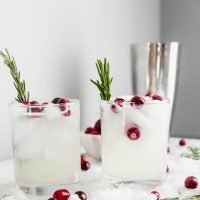 P.S – Since posting this Christmas cocktail, I’ve also shared 2 NEW cocktail recipes for the holiday and winter seasons: The Peppermint Mochatini and The Jack Frost. You basically need them both in your life. 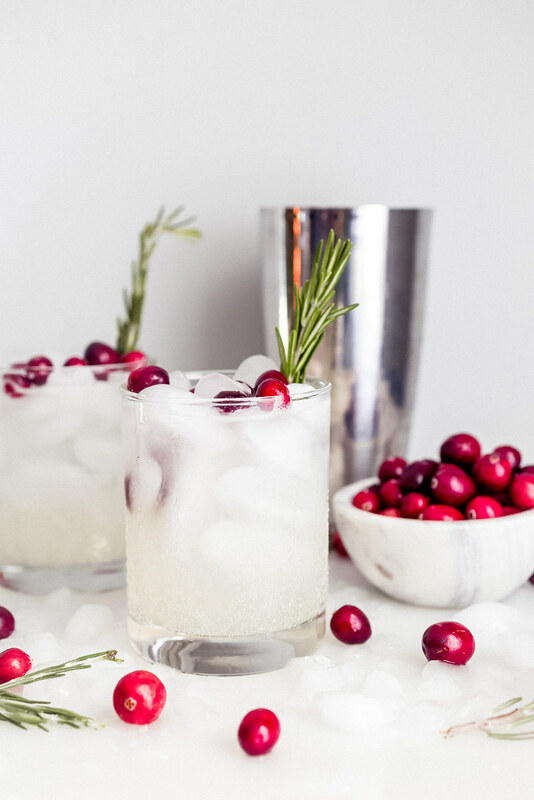 This is a holiday drink for the ages with vodka, lemon juice, and a special and insanely easy simple syrup that ties the whole drink together. Large batch recipe is included below for your holiday parties! To make a small batch: Pour vodka, lemon juice, and simple syrup into a drink shaker filled with ice. Cover and shake well to blend. Divide drink mix between 2 rocks glasses filled with ice, straining the ice from the shaker as you pour. You'll only want to fill the glasses ¾-full. Top with club soda and a few cranberries for garnish. Add a sprig of rosemary to use as a stirrer. To make a large batch: Pour vodka, lemon juice, and simple syrup into a pitcher filled with ice and stir well to combine. When ready to serve, pour the drink mix into an ice-filled rocks glass to ¾-full. 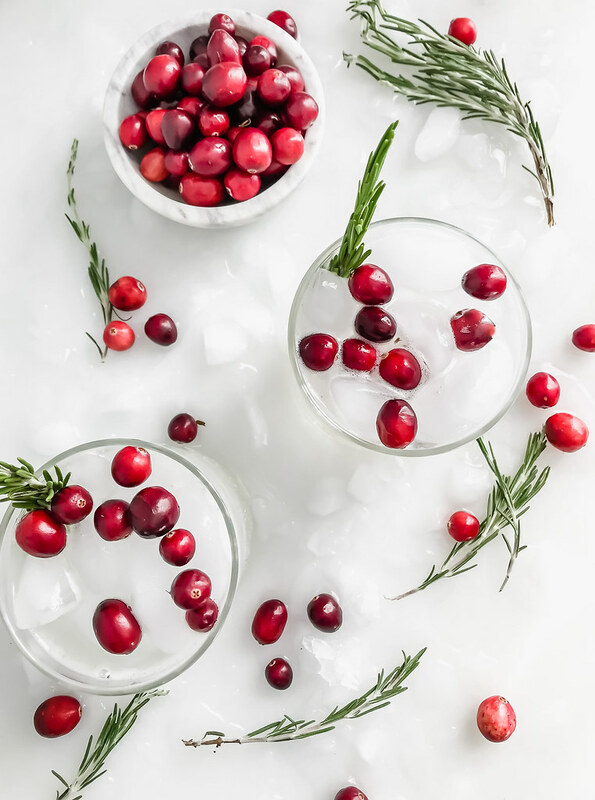 Top each drink with club soda and a few cranberries for garnish. 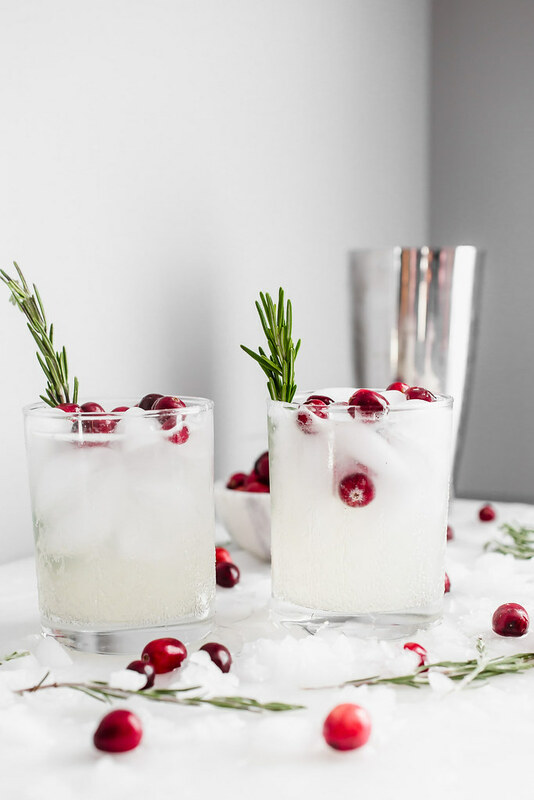 Add a sprig of rosemary to each drink as they are served to use as a stirrer. If you make the large batch before your guests arrive, be sure to keep the pitcher in the fridge to ensure the drinks are icy cold when they arrive. *The rosemary simple syrup recipe above will make more than you need for a small batch but the leftovers will store well in an airtight container, like a mason jar, in the fridge for up to 2 weeks. Print out instructions so your guests know how to assemble the drinks and post at your drink station. There is a Print Recipe button towards the top of this recipe box. Ready an ice bucket filled with ice as well as drink glasses so guests can help themselves to drinks from the pitcher. Have a small bowl of cranberries ready to go. Stand the rosemary sprigs up in a small glass.